Explanation: Why are the regions above sunspots so hot? Sunspots themselves are a bit cooler than the surrounding solar surface because the magnetic fields that create them reduce convective heating. It is therefore unusual that regions overhead -- even much higher up in the Sun's corona -- can be hundreds of times hotter. 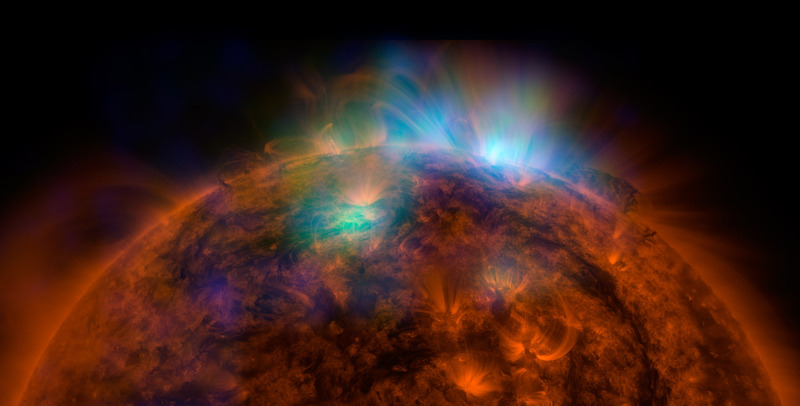 To help find the cause, NASA directed the Earth-orbiting Nuclear Spectroscopic Telescope Array (NuSTAR) satellite to point its very sensitive X-ray telescope at the Sun. Featured above is the Sun in ultraviolet light, shown in a red hue as taken by the orbiting Solar Dynamics Observatory (SDO). 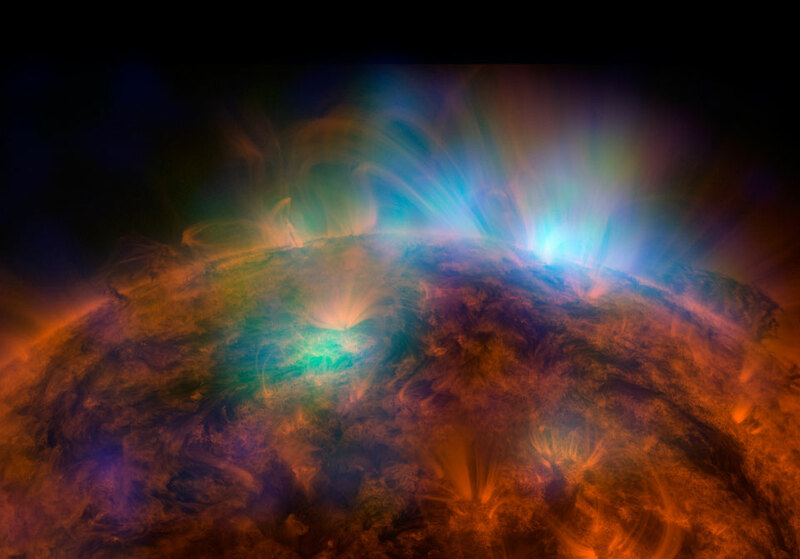 Superimposed in false-coloured green and blue is emission above sunspots detected by NuSTAR in different bands of high-energy X-rays, highlighting regions of extremely high temperature. Clues about the Sun's atmospheric heating mechanisms may not only come from this initial image, but future NuSTAR images aimed at finding hypothesized nanoflares, brief bursts of energy that may drive the unusual heating.